The gorgeous natural tones of natural coyote are truly exquisite atop our Women's Josephine Coyote Fur Stroller Coat. This upscale design for her is eye-catching to feature a matching shawl fur collar. A silky satin lined interior is lush and adds warmth during the winter months. Two concealed hook and eye closures may be adjusted to your preference. Two slit pockets on the side can be used to hold your valuables and keep your hands warm. 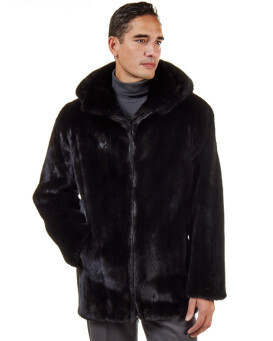 The long and lush coyote fur excellently accents the lengthy stroller style for a timeless impact. This designer piece is perfect for your wardrobe. Crafted in Natural Coyote this fur boasts long fluffy fur and amazing coloring throughout each piece.